Fishing is always at the top of the agenda when we visit my parents in Colorado. 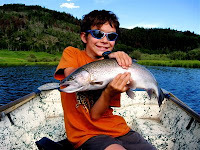 In years past my boy has demonstrated mastery of the Scooby-Doo rod, so this time out he insisted on a flyrod. I had visions of tangled line, a bird nest leader, and tears, but instead Riley threw a tight loop with his two-handed grip and effortlessly put a black woolly-bugger fly in the strike zone. The result: a beautiful brookie destined for the oven (not the ginormous rainbow in the photo at left, which was released unharmed). Usually we pan-fry our trout. But with a haul of wild mushrooms gathered on a hike in the Gore Range the previous day, including oyster mushrooms and aspen boletes (known to locals as orange-caps), we decided a stuffed baked trout was the way to go. A word about aspen boletes (Leccinum insigne): Most books and web sites list this species as edible. Coloradans regularly eat this common variety of porcini. However, the Colorado Mycological Society recommends caution. Every year the Rocky Mountain Poison Center receives complaints of gastro-intestinal distress following the ingestion of orange-caps, with some cases requiring hospitalization. In the Northwest there are similar complaints that derive from the consumption of Leccinum aurantiacum. I've talked to a mycologist who believes that a small percentage of the population at large—maybe just a few percent—is allergic to the genus Leccinum in general. Most people seem to eat these mushrooms without difficulty, and indeed, immigrants from mushroom-hunting cultures (e.g., Eastern Europeans) eat them with abandon. As with any new species of edible wild mushroom, it's recommended that you nibble on just a little bit (cooked of course) to make sure you're not allergic. To make this recipe I had to de-bone my first trout, a technique I had never attempted because it's easier to remove the backbone and ribs after the fish is cooked. 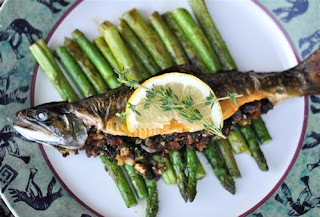 But a trout that has been fully de-boned and butterflied before cooking makes an elegant presentation, and a stuffed trout in particular begs for butterflying. I found this helpful YouTube video and then got to work. For the recipe I used this one, and as you can see, even brazenly lifted the photographic composition. Note that I've changed the amounts to suit my tastes (more mushrooms, for instanse, and the addition of parsley) and instead of serving 8, my version is for 2. Fry the bacon and remove from pan when crispy. Crumble bacon into a bowl. Saute onion in bacon fat a couple minutes over medium heat, then add mushrooms and cook for another four or five minutes, making sure mushrooms expel their moisture. Add thyme and cook for one more minute. Spoon onion-mushroom mixture into bowl with bacon and add bread crumbs. Mix together. Squeeze lemon juice over butterflied trouts and season with salt and pepper. Spread half the stuffing onto lower half of one trout; repeat with other trout. Fold over each trout like a sandwich and secure with toothpicks. Place on greased foil in a broiling pan and bake at 400 degrees for 15 minutes. Last time I saw the folks I cooked them Bourbon & Pecan Encrusted Trout. That was tasty, but the Stuffed Trout, we all agreed, was extra special. I'll be serving this to friends back in Seattle for sure. That trout your son has is HUGE. The stuffing looks delicious too. Wow, amazing! Fresh trout and wild mushrooms! Your tales of the Aspen bolete remind me why I'm scared of mushrooming. I do have one friend I go out with, and trust him enough to distinguish the edible from the poisonous. We found Aspen Boletes last year and a couple of weeks ago, but the info from the CO Mycological Society kept us from trying any. Might have to nibble a bit of one to see if I fall into the allergic category, although "severe gastric distress" and a hospital trip don't seem quite worth it. Ciao Chow Linda - The stuffing *was* delicious, and very simple to make. Store-bought shrooms can be substituted, but as you know, the wild stuff is superior. Julia - Fear not. Plenty of wild mushrooms don't come with an asterisk like the Barry Bonds homerun ball. Chanterelles, morels, and porcini are easy to ID once learned, and very few are allergic to those species. mdmnm - A small nibble of a cooked Aspen bolete shouldn't result in severe gastric distress even if you are allergic. It's the full meal you want to avoid the first time around. Now, with suspected deadly poisonous species, you never test for edibility. Theoretically, this same advice should be applied to commonly eaten wild shrooms. You never know what you may be allergic to. Amazing! I've never been big on fishing but I could probably pick the mushrooms :-) what a fest! I'm usually underwhelmed by trout on the table (tastes a little too much like its last meal, plus I'm much in favor of catch and release), but this version was a welcome exception. 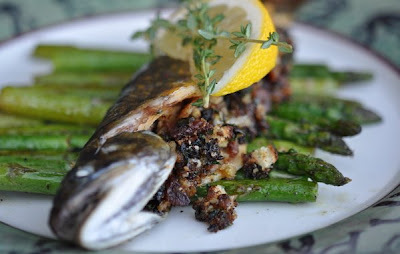 If a fish has to die, it deserves to be stuffed with wild mushrooms and a hearty dash of crisp bacon, then laid atop a pile of steamed asparagus. YUM! I love trout, just don't like dealing with the bones. This however, looks worth the trouble. Damn, that is one good-looking trout the boy caught. Can't wait to take mine out in about 5 years. Martha, you must be eating farmed mush trout, because it is one of the tastiest fish that swims. Caught and released fish often die anyway. Thank you so much for this recipe! Today my wife and I went mushroom hunting and also did some fishing (here in Colorado too!). I ended up bringing home 3 brook trout and a few boletes. Decided to look up "bolete and trout" and see if anyone had worked with these two ingredients before, and voila! Stoked I found your site, the recipe turned out awesome.